Natural Law | J.W. Wartick -"Always Have a Reason"
Natural Law: A Lutheran Reappraisal (hereafter NLL) presents a collection of essays from Lutherans of different backgrounds on the topic of natural law. Together, these essays are extremely strong, covering a broad array of topics and successfully bringing to light many of the issues one must deal with when approaching natural law theory. The individual essays presented in NLL are almost all extremely strong. The topics covered include the views of early Lutherans on natural law (including Luther and the authors of the Confessions) , the view of several later Lutheran individuals (like Barth and Forde), and a kind of “applied ethics” section which uses natural law in individual instances. 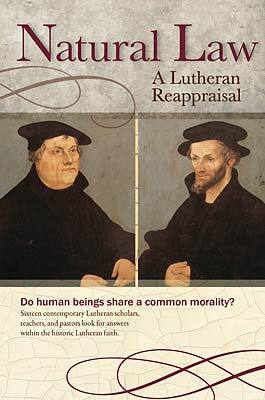 The strength of many of these essays is a credit to the Lutheran scholarship which went into the work. The insight into Lutheran thinkers’ views on natural law helps to refute some notions that Lutherans do not “believe in” natural law. In fact, it seems the opposite is the case. “Luther,” argues Thomas Pearson, “understands natural law not as a Christian teaching, but as an observation of human nature in general” (63). Later, Carl Rockrohr expands on this idea to view natural law as a place of common ground for evangelism (196-197). NLL really shines when it demonstrates that even topics which may at first seem unimportant (like an essay on Friedrich Stahl’s rejection of natural law) can serve to develop a modern view of natural law (Jacob Corzine argues in the aforementioned essay that Stahl’s critique helps ground a Christian natural law theory not in reason but in God ). The applied ethics section of NLL has its ups and downs. “Natural Science, Natural Rights, and Natural Law: Abortion in Historical Perspective” by Korey D. Maas is a simply amazing critique of abortion which presents the case for pro-life not as a religious issue, but as one which can be established on common grounds of natural law (228ff). On the other hand, Albert Collver III’s argument against the ordination of women struggles because it only presents one Lutheran view on the issue (more on that below). The section (and book) concludes with Matthew Cochran’s great summing up and case for the use of natural law as a “Way Forward” for discussions of epistemology and natural law (see esp. 274ff). The strength of NLL is therefore found in the fact that the essays manage to cohere to the point of building off one another. Whether this was intentional or not, it strengthens the whole work. The early essays provide the framework for the later developments into applied ethics. This is not to say the book is without faults. One such fault is the woefully inadequate glossary. While the terms included are defined in detail, some terms are inexplicably left out. For example, while the glossary takes lengths to define idealism, it makes no mention of “epistemology,” a concept which was referenced several times. This makes the book seem at times unsure of its purpose. Is it written for the layperson or the professional, the philosopher or the theologian? It includes study questions and a glossary, which suggests use as a textbook in undergraduate (or high school) theology classes, but the very nature of the essays included and the inadequacy of the glossary suggests that only those already familiar with some of the issues will get the most bang for their buck. A final criticism I would level against the book is that while it does present essays from various Lutheran traditions, it is clearly founded specifically upon LCMS teaching. This is unsurprising, given that it is published by Concordia Publishing House (the official publishing arm of the LCMS), but this could cause some confusion when the book devotes an entire chapter to a critique of a different Lutheran tradition (the ELCA). This small shortcoming can also be seen when the book only presents a complementarian view of natural law (that is, a view that natural law excludes women from the ministry) despite the fact that other Lutheran traditions (for example, the NALC or ELCA) are egalitarian (ordain women). NLL is a simply fantastic work. Lutherans looking to learn about the concept of natural law would be well served to pick the book up and read it cover-to-cover. Those outside of the Lutheran tradition would surely find NLL useful as well, as the essays on applications of natural law can serve as foils for the development of one’s own position. For those wishing to explore the important issue of natural law, I recommend the book highly.